With a cup of coffee in hand and a never fading smile, Nicole “Smiley” Mandracchia helps drive success as Top Brass Farm’s barn manager and go-to groom. Over the past 10 years, at Top Brass Farm, Mandracchia, 25, has cared for a number of horses. Currently under her management are nine combined driving horses and a collection of 19 hunter, jumper, equitation, grand prix, retired and young horses. At Top Brass, Robin Fairclough heads up the hunter/jumper training side of things, while her husband Jim drives four-in-hands competitively, including representing the United States at World Championships multiple times. Mandracchia began her career at the age of 12 riding at small local barns in New Jersey. Starting from the bottom she groomed for and worked with trainers around the area absorbing valuable information. She learned about the skills needed in the everyday care of a horse, from the most glamorous aspects of the show ring to the “dirtier” jobs. 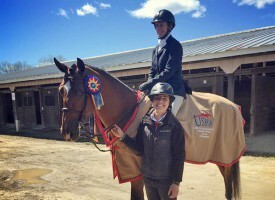 In the hopes of taking her riding career to the next level, Mandracchia began training at Top Brass Farm in the heart of Sussex County, N.J. When Jim and Robin Fairclough needed to bring on a working student, they decided to hire the every-bubbly Mandracchia, who was constantly making an effort to lend a hand and who was already spending lots of time around the barn. Mandracchia managed to balance her working student position with her class load while attending Centenary College (N.J.). Following her morning classes, dressed in breeches and tall boots, she would jet off to the barn for the afternoon where she would spend four to five hours helping do chores, manage turnout, and prepare for upcoming shows. She also juggles her duties with riding and showing her 12-year-old Dutch Warmblood-Selle Francais mare, Victoria’s Angel. The mare was Robin and Jim Fairclough’s first home-bred. Mandracchia has shown her in the low adult jumpers, adult amateur jumpers, and now 1.0-meter jumpers. A love for horses and an acceptance of the madness that the equine industry breeds is a must, especially when carting 12 to 20 competition horses up and down the East Coast. To ensure success, a knowledge and respect for each horse is key. An on-the-road show schedule might seem daunting to some, but Mandracchia has mastered her art of packing, laundry and repacking. Organization and effective communication are essential as she splits time between the combined driving and hunter/jumper worlds. Riding at the top level breeds intense competition. What distinguishes Mandracchia is her can-do attitude and unwavering willingness to aid others when needed. Surrounded by her peers for nine winters in Ocala, Fla., Mandracchia has learned that even the top tier professionals can sometimes use a helping hand. “I love helping out other professionals,” Mandracchia said. “Sometimes when we are at a horse show I will end up holding a horse for someone else, or throw a cooler on for another professional. I love it when people help me, so when I can help people I will! Professionals respect you a little bit more when you offer the help. It shows that you are taking an initiative, and they like that. There aren’t enough people now that take those initiatives. One who doesn’t flinch at a challenge nor at long hours, Mandracchia has truly worked her way to the top of the show circuit. She has not only found success in the show ring competing, but success in her profession managing Top Brass Farm. Her dedication has earned her great respect and admiration from her peers and team members. Mandracchia is a model for dedication—she has proven that the more you put into this industry the more you will accomplish. Success is hardly inevitable and is not to be expected without dedication, effort and time. This is an article in Groom Spotlight, a new series of groom profiles. Make sure to follow www.coth.com and like the Chronicle’s Facebook page to see them posted. If you know a fantastic groom you’d like to see appear in this series, email molly@coth.com.